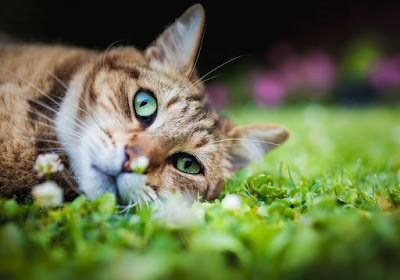 There is nothing like a lazy Sunday. Sleeping in till ten, maybe eleven in the morning. Waking up, but not getting up. Stretching hard, your feet pushing away the sheets. Then, slowly, you unfurl yourself off the bed, to go in search of food... and on this occasion, a few weeks ago, Simon and I decided to take a short walk to French Lettuce (237 Nicholson St, Carlton). We've visited French Lettuce once before, and that time we had their baguettes, which we liked. Firm crusts, chewy insides. Light, fresh fillings. We went for a baguette again - one with chicken, avocado, salad leaves and tomato, splashed with just the right amount of honey mustard dressing. 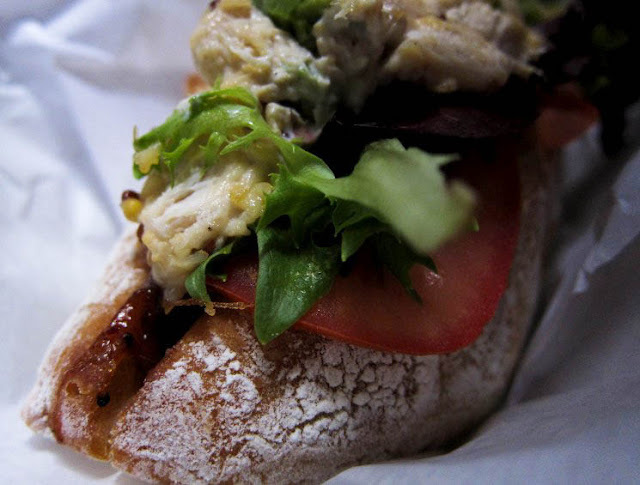 fresh and delicious chicken baguette. 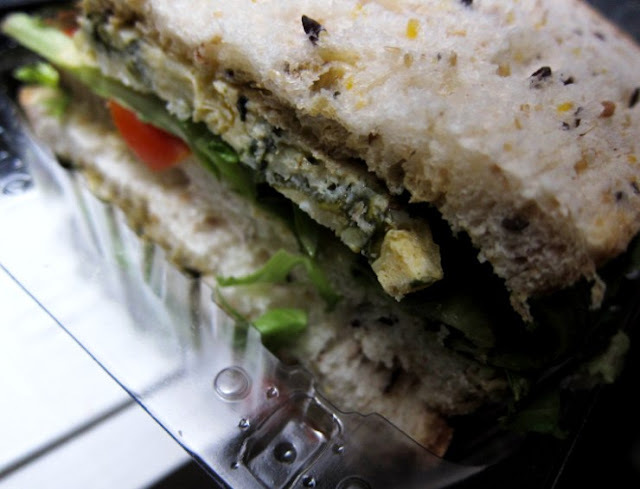 We also tried one of their sandwiches with frittata, pesto, semi-dried tomato and salad. I would probably have preferred a denser bread here, but the fillings were, again, well-executed. a soft sandwich with a very nice filling combo of frittata, pesto and semi-dried tomato. And I very, very nearly went for these sticky date and pear puddings - they looked so deliciously moist. I'll have to come back to try them. 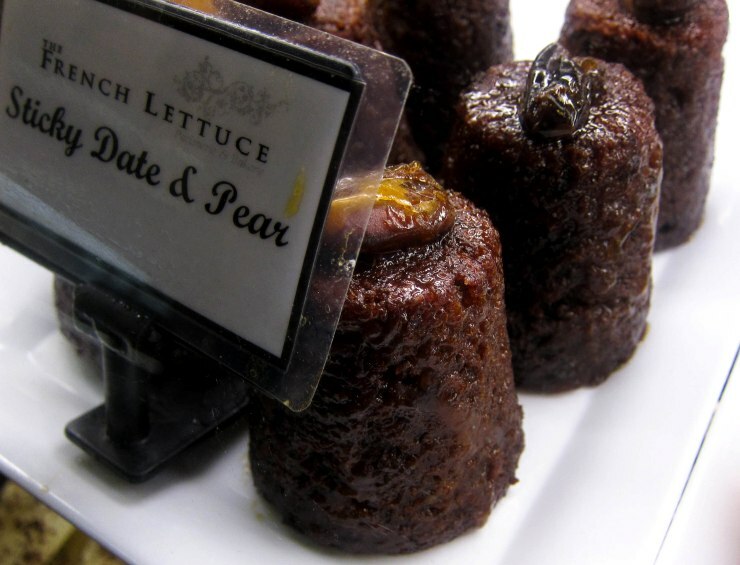 sticky date and pear pudding. 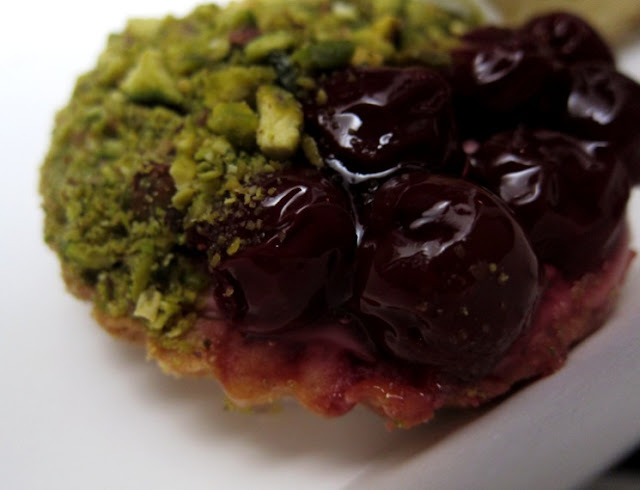 But then the sour cherry and pistachio tart caught my eye - it just looked stunning. What can I say? I'm superficial like that. Upon digging in, I found that while the crumbled pistachios were pleasant enough, they didn't do much for me in this context; however, the sour cherries were a winner - they provided such a lovely contrast to the vanilla cream hidden underneath. pistachio and sour cherry tart. French Lettuce is famous for their vanilla slices, with great reviews from Herald Sun and The Age. I'm not a vanilla slice connoisseur, but I can say that I enjoyed this, and so did Simon: the gentle crunch of the flaky pastry together with that fluffy and not-too-sweet custard made it quite the refined experience. French Lettuce's famous vanilla slice. Oh, and the rest of that Sunday was good, too. I met up with friends, had fun in the sun, and ate ice cream. Lovely! 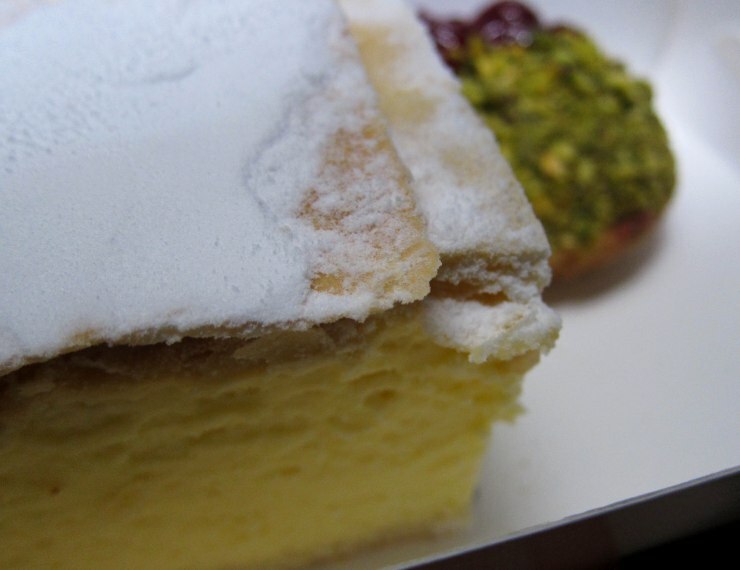 What a lovely Sunday :) But your post reminds me that I haven't had a vanilla slice in years! Gasp. What a treasure trove of delicious things! The vanilla slice looks perfect. It was, Agnes! Oh, and vanilla slices are rare in my life too, I'm not generally drawn to them. But yes, I did like French Lettuce's version. A treasure trove indeed, Foodycat. I should've taken more photographs of the displays with all their goodies! The sandwiches with frittata, pesto, semi-dried tomatoes sound wonderful. I'm inspired to try and make a version of my own. Sounds like a plan, Miss T - I'm sure they will have something that takes your fancy! This place looks lovely! Don't you just love lazy Sunday mornings...can't wait for this weekend! 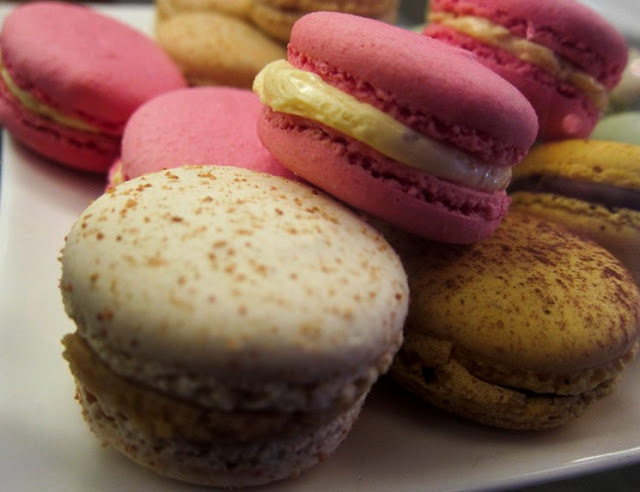 We share palates - I love macarons but would have gone straight for the cherry + pistachio one. I value any place that makes a solid baguette. By your description of the dough, it sounds like the real thing! Ooo what nice lovely things you had! And I can't eat a single item you've posted now :( BOO!! That sour cherry tart looks amazing and what I would give to eat that vanilla slice!!! I used to LOVE them (we call the custard squares in NZ), in my pre gluten-free days. Yasmeen, yes it's hard to pass on sour cherries! And the baguettes, yeah, Simon thought they were comparable to the ones he enjoyed years ago travelling in France. Aww, msihua. I hope this diet of yours is a temporary one! Heh, Emma. Maybe again, one day. Perhaps you can make gluten-free versions of these treats? I find freshly baked bread always brings out the best in whatever that goes with it. The sandwiches looks divine! My mother and i love vanilla slice. She used to buy it for me when i was a child. Haven't had one in years. Must endeavour to find a good one in Sydney. Any suggestions, anyone? I like a good vanilla slice. But I'd be going for the chocolate and pear looking at the options. Can't go past chocolate! I'm now feeling very hungry! The Food Sage, can't help you there but wish you lots of luck in your search! I hope your every Sunday from now on is as wonderful as this :) I would've opted for the sour cherry and pistachio creation too, because both of those ingredients are beloved in my heart. Bit sad it wasn't phenomenal though! OMG Where o start - baguette? Sticky Pud? or Custard Slice? 3 of my favs - sounds like a perfect Sunday morning with a sleep in and all! Now to replicate it in Auckland! I could do with one of them right now, too, Shellie! Thank you Hannah. I did adore the sour cherry section though. Perhaps I'm not a big enough fan of pistachios? Tudo tão delicioso! Tão bom!!! I love Vanilla Slice. And you just don't see it on offer in cafes/restaurants that much any more. Such a shame. But I think it's like all things, they come and go in fashion. Michelle - it really has a certain attraction, doesn't it? Hotly Spiced, now that you mention it, it does almost feel like the good old vanilla slice has a quaint quality to it these days!